What a luxury being at a marina in for a few days in Ft. Pierce. We are staying at the Harbortown Marina, and there are several boats here that we remember from the Bahamas last winter. It’s a small world! I always go through a bit of mourning when I come onboard. Everything is so small. Once again I’ve got too much stuff with me. This time around I think I will mail some clothing home. I can’t fit it all into my three small drawers! But this time around I have a 3rd set of bedsheets for when there is no laundry for weeks and weeks on end! This year I know that sheets are non-negotiable! Last night we met some of our new/old friends at the little open air bar at the end of our dock. It was a slightly chilly evening so we sat at a large fire pit that had gas flames flickering up through a large bowl of colored glass fragments. Very hedonistic! 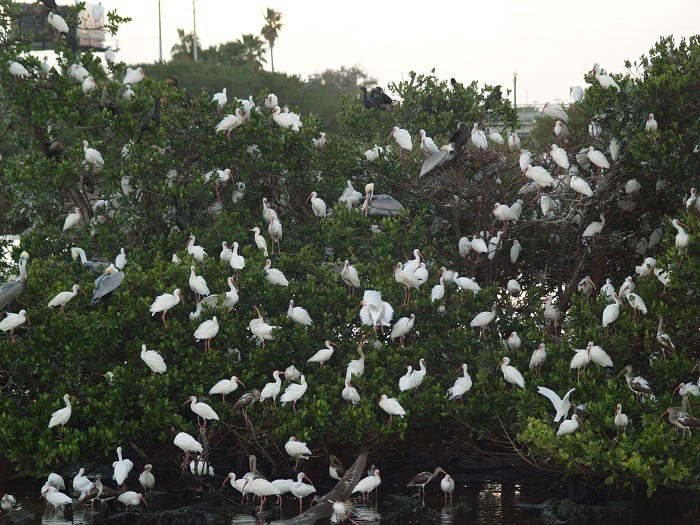 Just off from our dock are a few large mangrove bushes, and as sunset passed a huge flock of ibises began landing in the mangroves for the night. They looked like large puffy white blossoms on the bushes. Intermingled with them were a few blue herons and pelicans, but it was mostly an amazing vision of fluffy white ‘blossoms’ on the deep green mangroves. I hope to get photo this evening! To ease into boat life I had planned a very simple dinner with virutally no cooking. I made a large salad of greens and vegetables with goat cheese for a bit of protein. My mistake was that I’d recently had a delicious salad dressing at the Old City House Inn restaurant in St. Augustine, and I had just had to see if I could re-create it. It was a roasted shallot vinaigrette, so naturally I had to roast some shallots! And since I was doing that I figure why not roast a head of garlic as well which will surely get used in the near future. Well, imagine a slightly oily baking pan from the roasting, a messy miniature food processor from pureeing those shallots, a salad bowl, all the raiments from cutting the vegetables….in other words, I managed to make a HUGE mess in my tiny galley on an evening when I was just going to do something simple with no fuss. Ugh! Today promises to be picture perfect! Blue skies, a gentle breeze, soft temperatures. 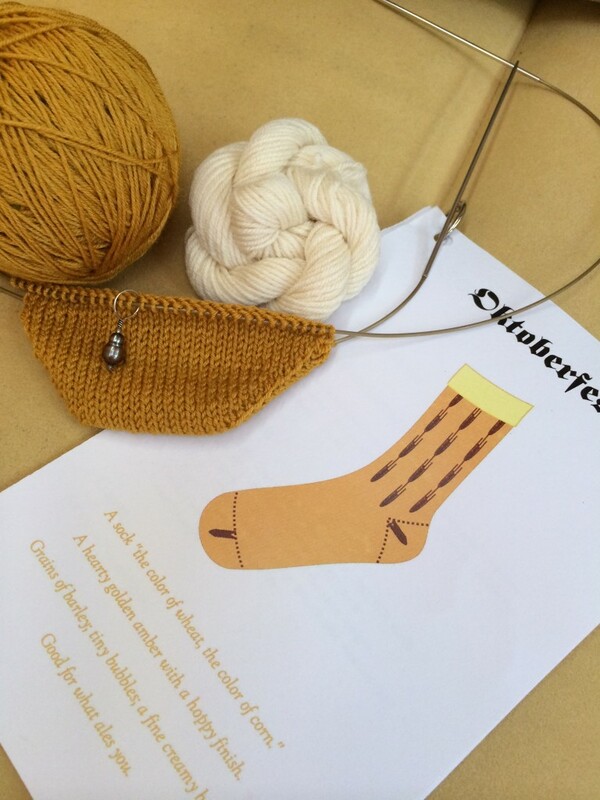 I have started my first “Tsock” pattern from the “Tsarina.” It is called “Octoberfest,” and I love the bright golden colorway, including a light frothy ‘head’ for the top of the sock. I enjoyed trying out her toe beginning. For my other toe-up sock, the “Skew” sock from Knitty, I started by wrapping and casting on to two needles held parallel. For Octoberfest you cast on half the number of stitches and work back and forth in short rows to create the toe. It was easy and somewhat mythical watching the toe emerge from this simple technique! Today, if there is time after the endless chores, I will knit the straight stockinette bit of the foot toward the heel. This entry was posted in knitting, sailing, travel. Bookmark the permalink.